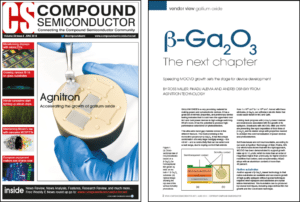 Direct download the article from http://data.angel.digital/pdf/Compound_Semiconductor_Issue_4_2018.pdf or find it at https://compoundsemiconductor.net/magazine. Agilis is a state-of-the-art MOCVD platform for R&D scale processing. This compact system is configurable for study of a wide range of materials. In contrast to other legacy equipment vendors Agnitron offers already refurbished and upgraded systems located at out facility in Eden Prairie, MN. Systems are powered up and available for demonstration. IMPERIUM-MOCVD™ is a windows based software package developed for upgrading legacy MOCVD tools for state of the art processing at a fraction the cost of purchasing a new system. Copyright 2019 Agnitron Technology, Inc.